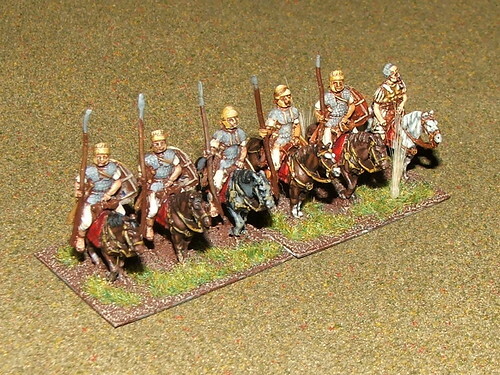 The Marian Roman DBA army consists roughly of two legions. This army has seen much action: It has had great success fighting against the Germanic tribes to the north under its current general: Athanasius Numerius Calpurnius Ingenuus, who received the titles: “Dominator Germanorum Omnium”, and “Romanus Maximus”. Most recently the 1st & 5th were led by Athanasius against the armies of the Republic in a bid to reorganize the government. They made it far enough to see the Tiber, but were turned back without substantial loss. They retreated to northern Greece and proceeded to the North-West. While in transit, the legions crushed a Gallic army that was bribed by the Republic to interdict them. Under its former generals, the army suppressed an uprising in Egypt, immediately defeating an army of enterprising Sea Peoples raiders. The legions have survived two major losses: Once in Italy during a period of civil war, and once in Judea where it lost its founding Consul: Manius Cornelius Superbus. This army also fought in a war of attrition with the remnants of a Carthaginian army; while the war ended in a stalemate, the legion lost its second general: Pro-Consul Aulus Cornelius Superbus, son of Manius, in a daring action behind Carthaginian lines. Athanasius and his Legions are currently wintering in Germania among friendly tribes, waiting to regroup with his fellow members of the Tiumvirate: the Roman general Tiberius Flavius Vespasianus Optimus Maximus, and Consul Sextus Flavius Ursis Numidicus Africanus. The legions expect to arrive in Spain in Late July. Read more about the Legion’s adventures in Athanasius’ journal. All figures are AB Miniatures except the psiloi, which are Essex. The AB figs are great, and realistically proportioned. The only problem that I had was that the 18mm size proved difficult to mount on a 40×15mm base, so I had to portray the Bd elements as “open order” and staggered them on the base. The army is pretty uniform, and I have not painted up any of the Lh or Ax options. 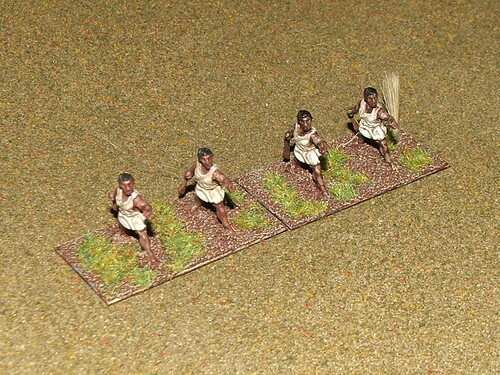 The only real variance color-wise in the army are the psiloi- painted as Numidians. This was my first army.